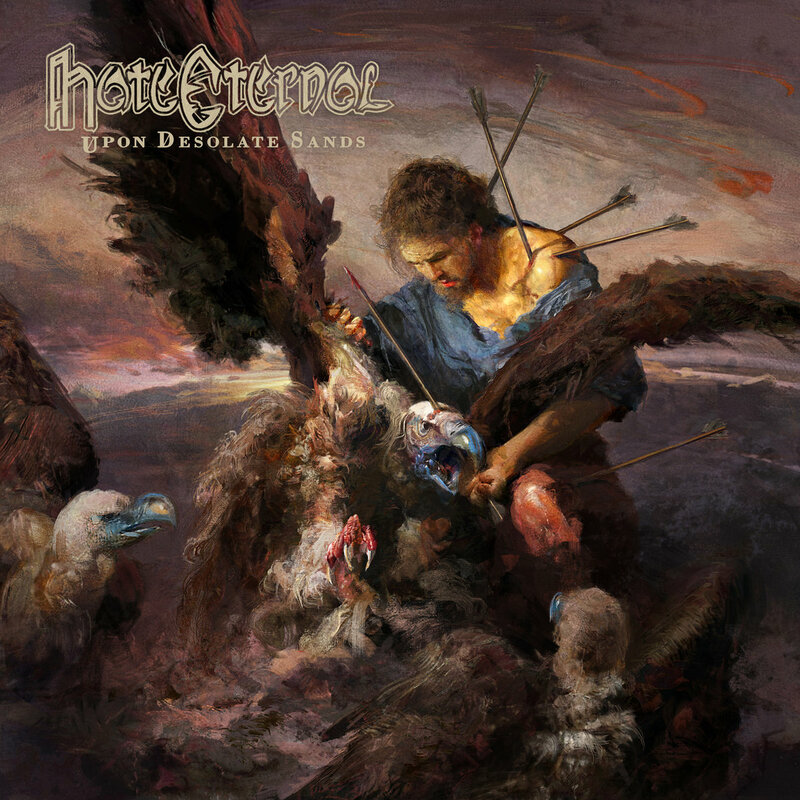 There’s something about the sound of Hate Eternal that really catches me. As soon as I queue the opening track off their first album in three years, I instantly recognize the combined sound of the drums, the guitars, and of course the distinct roar of sole remaining original member, vocalist Eric Rutan. Their original brand of death metal has changed very little over the years, as the band has managed to put out new records at a fairly steady pace. Although they still fly somewhat under the radar of what is considered to be popular death metal (at least here in Europe), they still rank as one of my absolute favorites of the genre, and I deeply hope that they will escape the confined space of the death metal underground. Perhaps “Upon Desolate Sands” would turn out to be the album to push them through to the masses, especially given the newest addition to the band in the shape of none other than drummer Hannes Grossmann (formerly of Necrophagist and Obscura). I’ve certainly had a hard time not getting my hopes up for the record, so hopefully it would not be a disappointment. As already mentioned in the introduction, the sound of Hate Eternal is greeted with open arms by yours truly, being a quite original, raw and unpolished death metal sound. The guitar has that eerie, almost nightmarish sound to it that makes it so easy to recognize whom we’re dealing with here. The aforementioned first track, “The Violent Fury”, quickly picks up the pace to offer a barrage of straight-up death metal right from the get-go. It is actually not unlike the sound Morbid Angel used to deploy on their first couple of classic albums, but eventually the tempo is turned down a notch to bring in a melodic segment just shy of the 2-minute mark. This passage ensures variety, and even though I can already tell that it’s not the best track on offer here, it still represents a strong start for Hate Eternal. As this song also goes to show, Grossmann is an insanely talented drummer, his playing tight and fast whilst still being very headbang-friendly — not that his predecessors like Derek Roddy, Jade Simonetto or, most recently, Chason Westmoreland, were not as well. But to me it does sound like Grossmann tries to influence the direction of the music more than any of those previous musicians, and he has only just joined the pack. This is of course a good thing, especially as it does not subtract anything from the signature Hate Eternal sound, and should be a change welcomed by any devout fan of the band. The variety present across the record is immense. Almost every track sees a constant shift in tempo, with either slow, almost droning percussion, or very fast-paced blastbeats dictating the rhythm. In other words: the songs that “Upon Desolate Sands” contains are consistent yet also structurally varied, whilst still — for the most part — managing to not blend together into a grey mass, as so many albums in this genre tend to do. The first definitive highlight arrives with “Vengeance Striketh”, the primary focus of which is again on the drumming, which leads the track in nicely with its marching pace. This, coupled with a haunting riff and a clever song structure, sets the pace for a track which has Hate Eternal sounding as brutal as ever, only to then morph into a classic heavy metal outro, much to my surprise. The special nightmarish guitar tone heard on the track isn’t unfamiliar to Hate Eternal, having become almost the trademark of their sound, with its roots reaching all the way back to their earliest releases in the late ‘90s and early ‘00s. It is heard on other occasions as well, such as in “Dark Age of Ruin”, and thus serves as a kind of red thread running through the album. 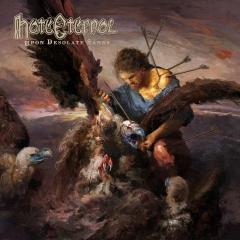 Hate Eternal also know their way around the more brutal and hard-hitting death metal style, as seen on “Nothingness of Being”, and the absolute album highlight, “Upon Desolate Sands”. From the latter track, I get a “Scourge of Iron”-vibe (the Cannibal Corpse song), with its very simplistic riff and drum pattern, but when a track is as cleverly structured as this, it’s hard not to bang your head to the insanely heavy beats nonetheless. This song is one of the best death metal tracks released this year in my book, and after ending on a slow and heavy note with “For Whom We Have Lost”, I’m utterly convinced of “Upon Desolate Sands”’ prowess as a banger of a death metal album. What speaks against it being the record to propel them toward death metal stardom, however, is that Hate Eternal remains a challenging listen. 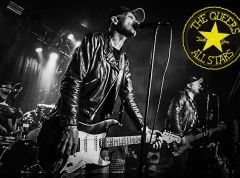 The band never tries to lure in new fans with easy tricks like excessive utilisation of breakdowns or melodic hooks, preferring to prove themselves as an old-school act instead. To me, this is a bit sad, as a group of musicians as talented and revered (by some) as this definitely deserves more recognition — and not only from a select few. Therefore, I don’t think that “Upon Desolate Sands” has what it takes to transform Hate Eternal into a household name in Europe at least, though if anyone happens to stumble upon this hidden gem, they are in for a treat all the same. This is how the late ‘80s and early ‘90s style of death metal sounds in 2018: raw, unpolished and very, very extreme.